Making jewelry doesn't get easier than this. 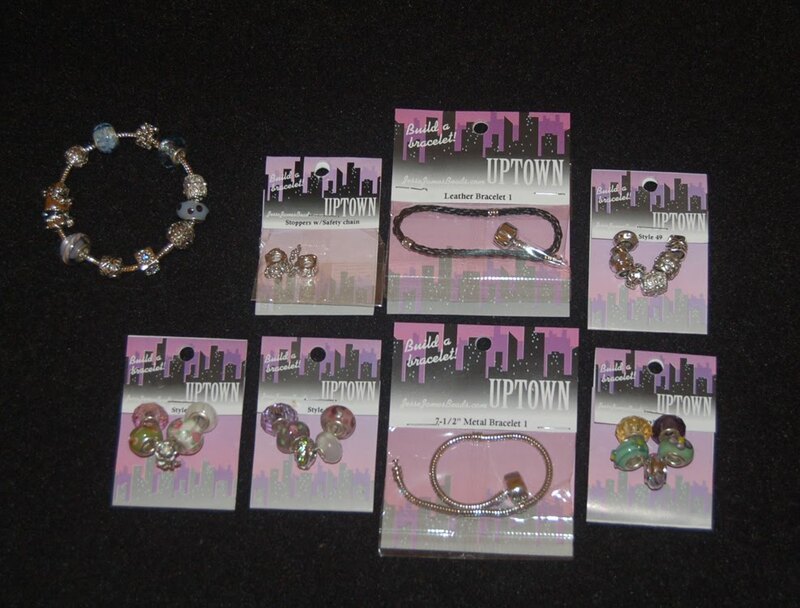 The Jessie James line of produsts called Uptown sold at Ben Franklin Crafts is the solution for crafters who don't have a lot of time but want to make something pretty to wear or give. In the line are dozens of metal lined glass bead packs, two styles of bracelets (silver and leather), safety chain beads, and decorative metal beads. All the beads have large holes so they can slip over the cording. The clasps attached on the bracelets are magnetic and cleverly look like silver beads. I love the color combinations in the bead packs and only two packages of beads are needed per bracelet. You could probably also find other large hole beads at Ben Franklin Crafts which would also look great on these bracelets. It takes less than ten minutes to create a very special piece of jewelry. If you use birthstone colors or school colors you could customize a bracelet for that lucky birthday girl or graduate. Be sure to design one for yourself, too because the look and feel of these bracelets make them perfect for a craft queen......YOU! Ooops! It Actually Looks Better! I can finally relax a bit because my son's graduation was on Saturday. All went well, even his val speech. There was so much confusion after the ceremony because of the large number of graduates and people who wanted to give them leis. I feel bad that we didn't get to see everyone who gave our son leis. Hopefully they know how much he appreciated the time and effort it took to be at the graduation/make a lei even if he can't remember exactly who gave him which lei. 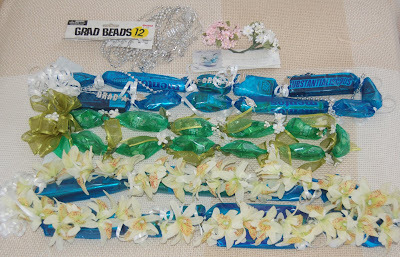 Pictured here are some of the quickie leis we assembled in a marathon lei-making evening. We chose to make candy/snack leis because the flower leis really get crushed by the time all the leis are around the neck of the graduates. I still had a few crochet leis that I made last year so we gave out those too. The good thing about yarn leis is that they stay good looking for years and can even be recycled to another graduate. That's not tacky.....that's being GREEN. LOL! What I wanted to point out about our candy leis is that we dressed them up by tying on the artificial orchid leis, Mardi Gras style graduation beads, or bunches of wedding favor flowers from Ben Franklin Crafts. I'm sure that you can find all sorts of interesting decorations at BFC to make your candy leis more unique. 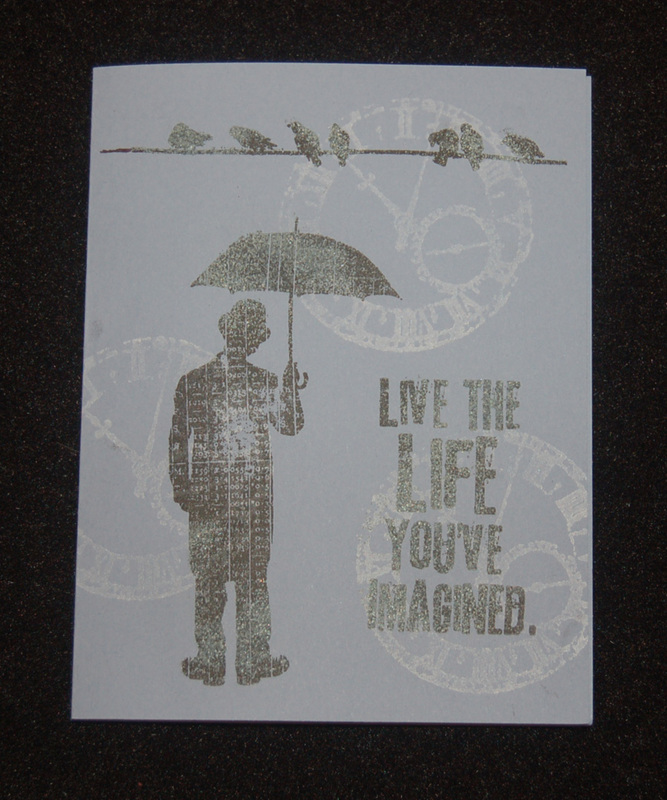 Well, before I take another needed nap, I have to finish a few more grad cards and get them in the mail. The countdown for graduation is on and I'm still making cards and leis. Can you believe it? Where did all my time go? 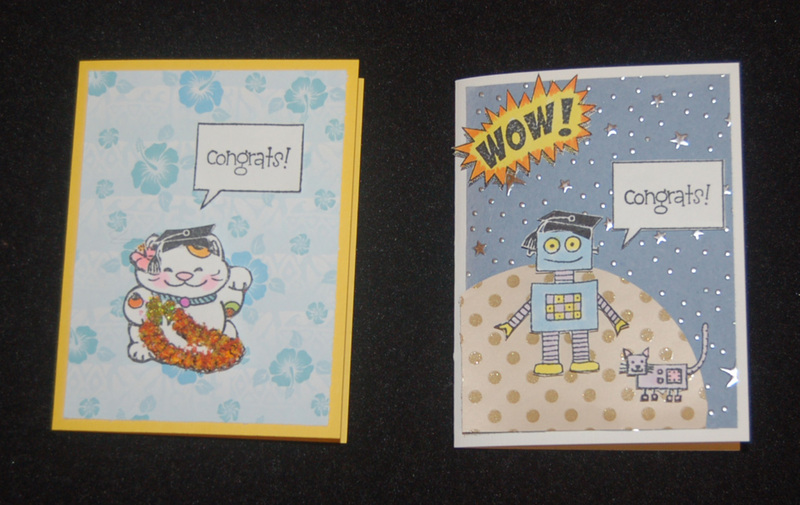 Shown here are two simple cards which are sure to please any graduate because they will contain moolah. I really wanted to do some fancy ones but at least I did make them myself. The tiny grad caps and 'Congrats' are Dandelion Design stamped images. 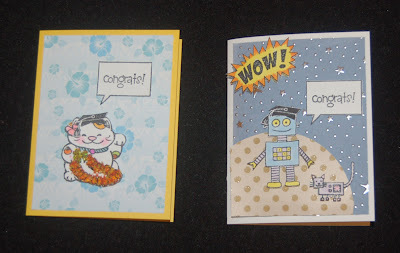 The robots and word box are from a Hero Arts clear set, the lucky cat is a Mari and Me stamp, and the 'WOW' stamp is from the Comic Talk set by Recollection. 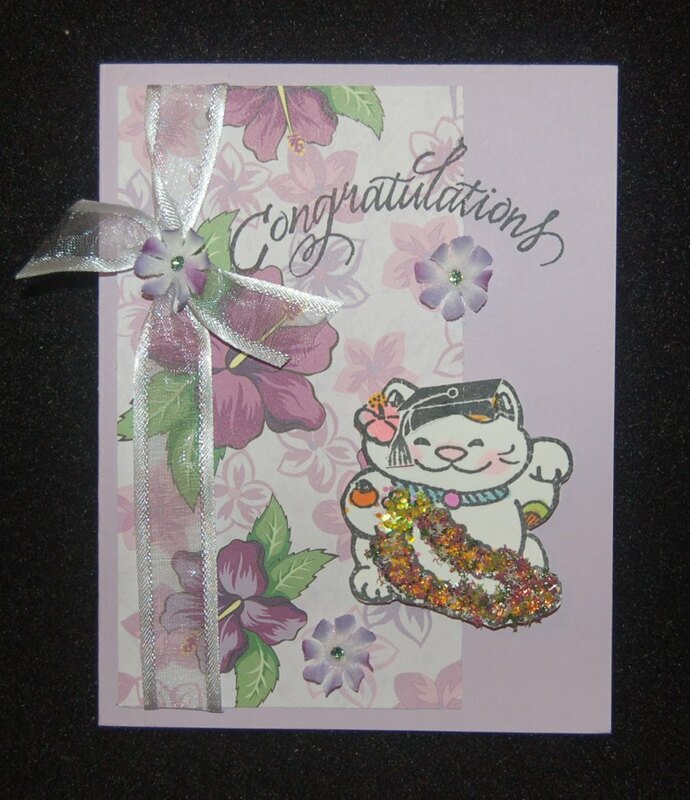 I put Flower Soft on the lei, Martha Stewart glitter was used on the lei ribbon, and the characters are raised up on foam dots from a pack of This to That 275 piece set by American Crafts. 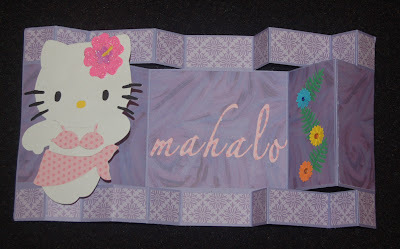 Well, I gotta go and finish up the leis before going to bed.....I should be done before dawn. Our travel schedule has been rather hectic due to my son's science competitions. We just returned from San Jose where he participated in the International Science and Engineering Fair (ISEF). Amazingly even though it is the biggest pre-college science fair in the world, he did very well and placed first and Best in Category for Cellular and Molecular Biology. It was a perfect ending to his high school career. Now on to his graduation! Aargh, I'm so behind because of all the traveling we did in the last few months. Of course during this last trip I did have some down time and did a little shopping. My favorite store that I discovered was a Tibetan one in Palo Alto that had all sorts of handmade items. 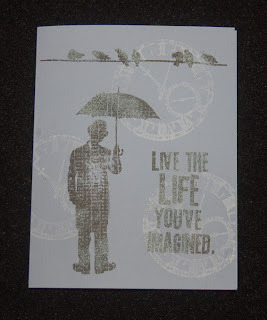 I fell in love with the handmade paper and hand carved wood printing blocks. Upon returning home I wanted to give something to those who had taken care of our pets, cars, and mail/newspapers. I usually bring home food items but this time I decided to do something different. 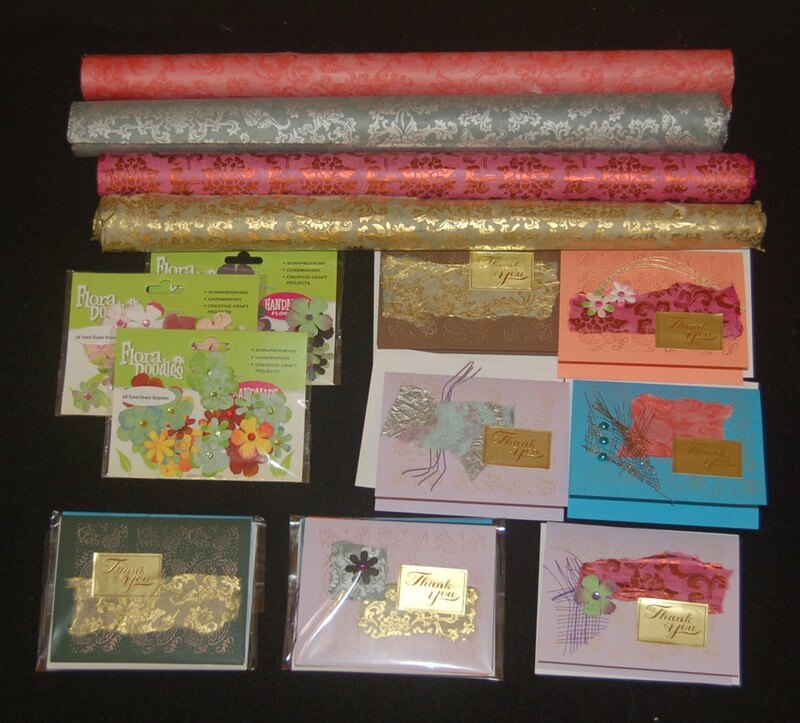 I used the handmade paper to make thank you card sets. I didn't have lots of time because I need to do those leis and send out the announcements/photos, so I kept the cards simple. 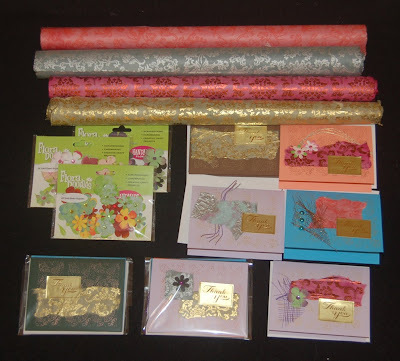 First I stamped the cards with a paisley design using gold ink, then I added bits of the Tibetan paper and embellished with mizuhiki cord, fiber, and/or tie-dyed flowers. The tie-dyed flowers were part of a Mother's Day gift from my craft club daughters, Regina and Carin. I love the look of the flowers and think they match well with the paper. I was able to acheive a look similar to the tie-dyed flowers by misting Prima flowers ( in the bottle that I felt were too muted in color) with water. Then I put tiny drops of dye on the wet flowers. After they dried rhinestones were glue in the center. Now I don't have to hoard the flowers that were given to me because I know that I can replicate them if I need more. Okay, I have to get back to graduation stuff. Thanks for reading this rather long blog. If you want to make a useful, unique graduation gift/lei and you are a novice at crocheting, this is the project for you. I can't crochet neatly, but in this project you don't need perfect stitches because the gigantic hook and bulky yarn cover all the mistakes. Start with one bulky yarn and one fancy yarn. 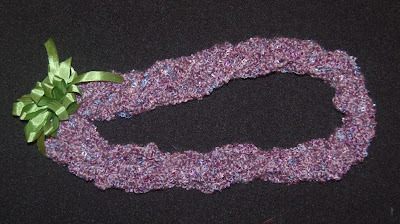 Using an extra large crochet hook, chain about 4"-5" using both yarns together and then single crochet until you have a 7 foot scarf. 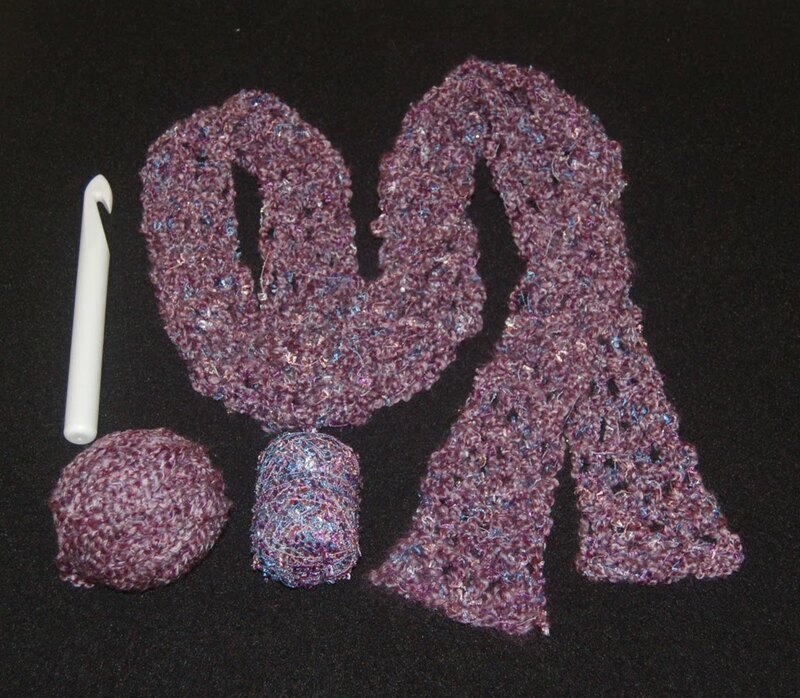 Fold the scarf in half and twist the two halves together to form a lei. Use a ribbon to weave the ends of the lei together and form a bow. When you give this lei, include a tag to instruct the recipient to carefully remove the ribbon to reveal a scarf. I think this lei is a clever way to give a scarf which can be used by a graduate going on to a cold weather college. Most leis are barely looked at (even handmade ones) or die (flower ones) after graduation so consider making a scarf lei......it's easy! When traveling I brake for antique stores. I always poke around for the boxes of odds 'n ends. While in D.C. I found a little shop that had a treasure of broken and one of a kind jewelry parts for just a few dollars each. Here are some of the goodies I found and plan to incorporate into my jewelry designs. 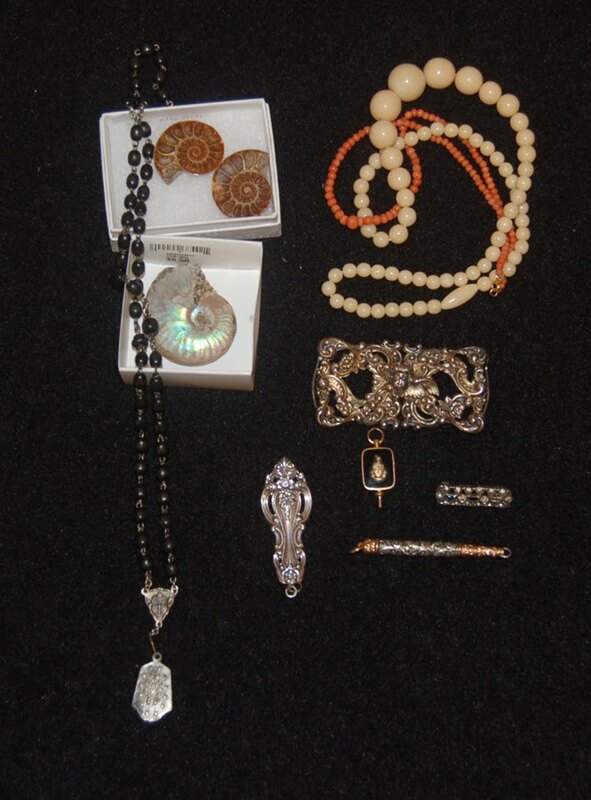 The fossil shells were discovered in an airport Smithsonian shop and were incredibly priced. I thought that they could be drilled and would make eye-catching focal beads. Keep your eyes open for special parts for your craft/jewelry work......they are out there everywhere. Thank you for stopping by and reading this post. I hope that it has been interesting and that you will come back again. 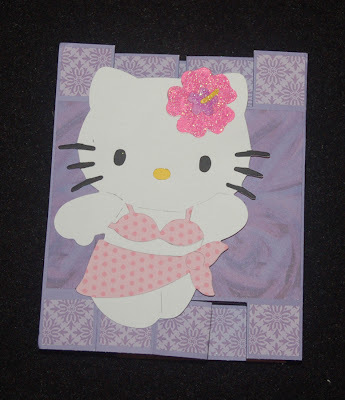 I made a bunch of these felt flowers using the Ellison Hello Kitty Daisies die. After cutting out the flowers I used embroidery floss and S.E.I. buttons to secure the layers together. I was going to use them on another project but they just didn't look right. 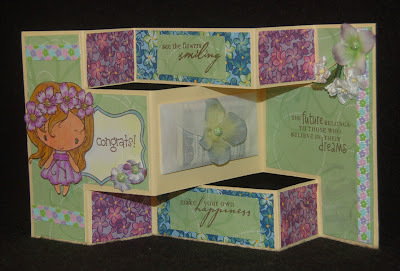 Since I was looking for a Mother's Day card idea, I decided to use one of the felt flowers with Doodle Bug and Bo Bunny papers. The stamped words are from Dandelion Designs and the stamped oval is from a Hero Arts set called Three Floral Frames. I like how the two papers worked together with the flower. Since I started putting all my papers in themed stacks (flowers, kids, animals, etc.) it is easy to find papers that coordinate. 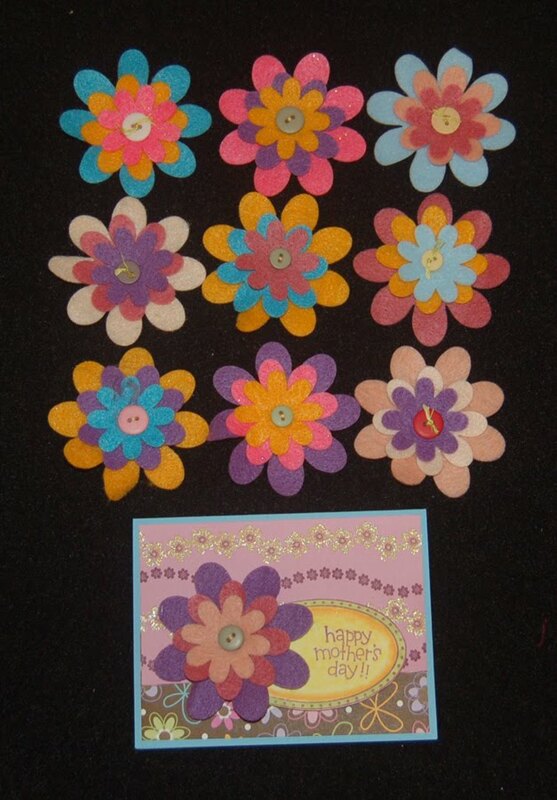 I think any crafty mom would appreciate this card along with a package of these handmade blossoms. Well, have a Happy Mother's Day! Whew, we just flew in from D.C. and boy are my arms tired....sick joke. Anyway, sorry for not commenting on more blogs but a laptop in a hotel is not like a computer at home. I tried to keep up with most of your delightful blog posts. Before leaving on my trip, I did receive this beautiful thank you card from Jan for the blog candy she won in our last contest. 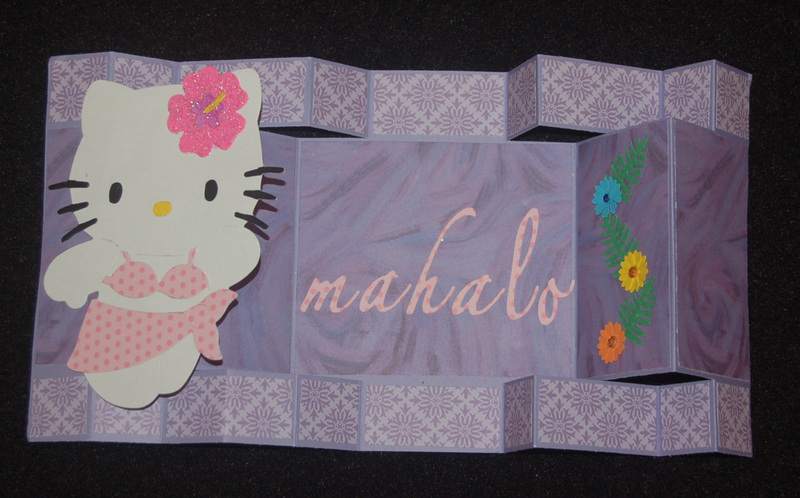 I admire her color choices and the extremely neat crafting job on the card. Thank you for the 'thank you' card, Jan. I really appreciate it when I get a handmade card. Oh, one more thing, I finally posted the instructions for the rose gold necklace on our website (http://www.bfcraftclub.com/) . It's so easy to make this necklace that you can definitely finish one before Mother's Day. Although my mom died many years ago, this pearl necklace is one that I would make for her if she were here. 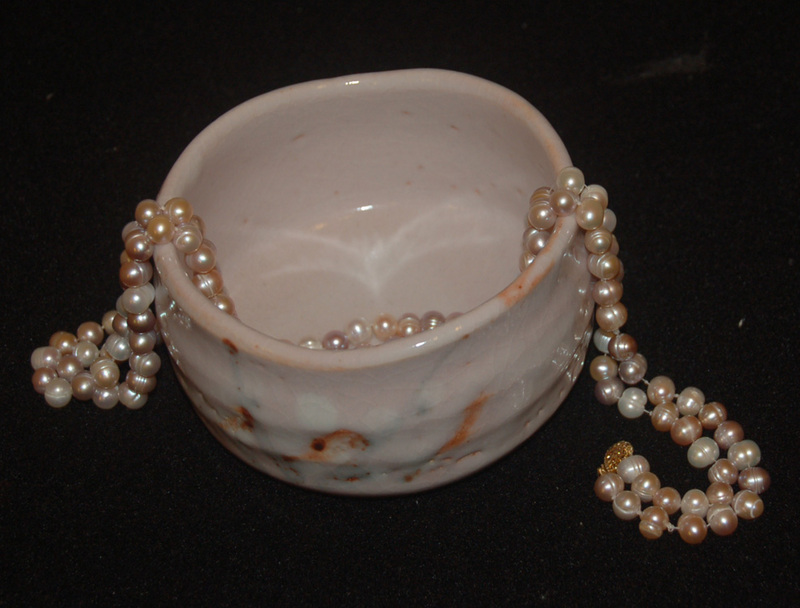 I absolutely loved the soft pink, grey, and white pearls when I saw the 18" strands at Ben Franklin Crafts. These pearls are not perfectly round but I think that adds to their charm and keeps the price reasonable. Learning to make a knotted pearl strand requires practice. The finished length of the necklace is 36" which makes it versatile to wear, as is, or wrapped twice around your neck. It is important to use the correct thickness of beading thread so that the knots will be large enough to not slip through the pearl holes. Also some threads require stretching and rubbing with beeswax. I used French wire over the parts of the thread that pass through the clasp to reduce abrasion on the thread. If you want to thrill your mom with a pearl necklace like this, consult basic pearl stringing instructions from a book or the internet. It should take only a few hours to make a mom pleaser pearl necklace.